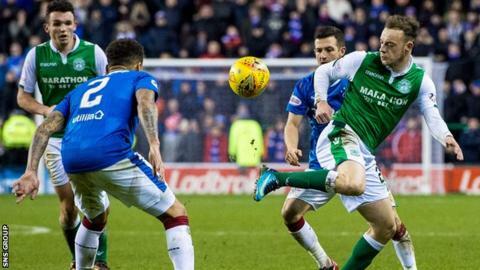 Hibernian remain firmly in the hunt for a second-place finish in the Premiership, despite losing ground to Rangers, says winger Brandon Barker. Wednesday's 2-1 defeat at Easter Road leaves Hibs six points behind Rangers and Aberdeen, who they visit next. "Rangers are second now but we've shown we can dominate them," said Barker, who hit the post twice after coming on as a second-half substitute. "It hasn't been an even game if we're honest." Hibs took an early lead through Lewis Stevenson and had Rangers pinned back for most of the game but were undone by goals from Josh Windass and Alfredo Morelos in a five-minute spell before half-time. Morelos also made a mess of two close-range headers as Hibs fell to a fourth home league defeat of the season. "They have had two free shots and scored with both," said Barker, on loan from Manchester City. "That's not great but we've gone toe-to-toe with them and dominated. That will give us confidence." The 21-year-old lit up the the second half with a series of thrusting runs on the left, with Martin Boyle a constant menace on the opposite wing. Simon Murray failed to connect with a Boyle cross in front of goal, while manager Neil Lennon was irked by the officials failing to penalise a "clear" penalty-box handball by David Bates. "It was horrible," said Barker, who cracked both posts and saw a third effort fizz over the crossbar. "I'd rather get beat 4-0 than lose a game like that." "We dominated the game from start to finish, especially the second half when we were all over them from the first whistle. "It's just one of those days and at the minute it just seems like we're not getting that slice of luck that we need. "Hopefully that luck will come soon. "Look at the penalty claim. It was a stonewall but the ref obviously hasn't seen it. Again that is that bit of luck we're missing. We needed the ref to give that to get us back into the game. "But I'm not going to moan and say we should have got a pen because we could have scored (before that) and won the game 4-2. It's annoying when you don't get a decision like that but the game, in our opinion, should have been dead and buried before that. "I decided before the game to shoot as much as I could but ended up hitting both posts, which is gutting. The keeper has made an unbelievable save on the second one. "But I'll just need to go again and shoot some more on Saturday."